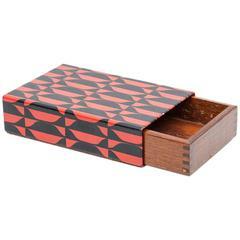 This is a wonderful vintage Piero Fornasetti box. 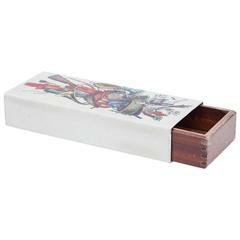 It has a enameled metal cover with an iconic image of ancient printed view of Florence (Tuscany, Italy) and a wooden two-compartment box. The bottom is grey felt. Manufactured by Fornasetti Milano. The Italian artist, illustrator and furniture maker Piero Fornasetti was one of the wittiest and most imaginative design talents of the 20th century. He crafted an inimitable decorative style from a personal vocabulary of images that included birds, butterflies, hot-air balloons, architecture and — most frequently, and in some 500 variations — an enigmatic woman’s face based on that of the 19th-century opera singer Lina Cavalieri. Fornasetti used transfer prints of these images, rendered in the style of engravings, to decorate an endless variety of furnishings and housewares that ranged from chairs, tables and desks to dishes, lamps and umbrella stands. His work is archly clever, often surreal and always fun. Fornasetti was born in Milan, the son of an accountant, and he lived his entire life in the city. He showed artistic talent as a child and enrolled at Milan’s Brera Academy of Fine Art in 1930, but was expelled after two years for consistently failing to follow his professors’ orders. A group of his hand-painted silk scarves, displayed in the 1933 Triennale di Milano, caught the eye of the architect and designer Gio Ponti, who, in the 1940s, became Fornasetti’s collaborator and patron. 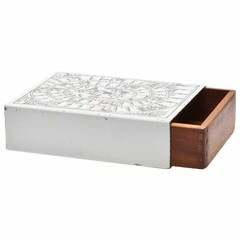 Beginning in the early 1950s, they created a striking a series of desks, bureaus and secretaries that pair Ponti’s signature angular forms with Fornasetti’s decorative motifs — lighthearted arrangements of flowers and birds on some pieces, austere architectural imagery on others. The two worked together on numerous commissions for interiors, though their greatest project has been lost: the first-class lounges and restaurants of the luxury ocean liner Andrea Doria, which sank in 1956. Fornasetti furnishings occupy an unusual and compelling niche in the decorative arts: they are odd yet pack a serious punch. They act, essentially, as functional sculpture. A large Fornasetti piece such as a cabinet or a desk can change the character of an entire room; his smaller works have the aesthetic power of a vase of flowers, providing a bright and alluring decorative note. The chimerical, fish-nor-fowl nature of Fornasetti’s work may be its greatest strength. It stands on its own. Bringing the Fornasetti look into the future is Barnaba Fornasetti, who took the reigns of the company after his father's death. 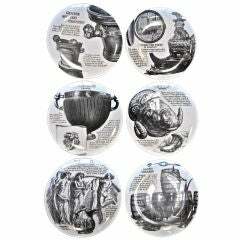 Series of 6 plates designed by Piero Fornasetti for Martini & Rossi from the good ol' 80s! 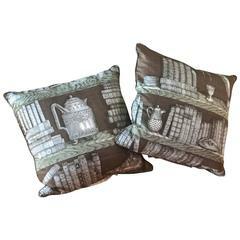 Pair of &quot; Piero Fornasetti pillows, 1950s. Vintage. 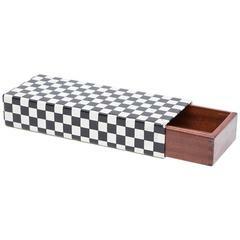 Tommaso Barbi Vintage Brass Box, Italy, 1960s.